The Indian Markets had an yet another quiet session as the benchmark index NIFTY opened positive, remained in a capped range and ended the day with a modest gain of 22.90 points or 0.22%. The volatility remained absent except or some small movements and the session remained much more stable than expected. As we enter Wednesday’s trade, we expect some consolidation happening and the Markets taking some breather. We are very short distance away from the 50-DMA and the 100-DMA levels which remain in the very close vicinity and we expect the Markets to take some breather at these levels. Both 50-DMA and 100-DMA stand at 10438. Wednesday will see the levels of 10440 and 10520 levels acting as immediate resistance levels for the Markets. Supports come in lower at 10365 and 10310 zones. 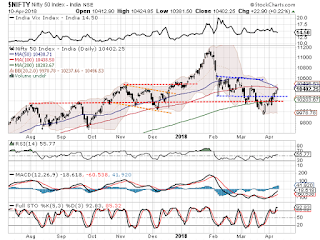 The Relative Strength Index – RSI on the Daily Chart is 55.7665 and it has made yet another 14-period high which is bullish. No divergence on RSI is seen against the price. The Daily MACD continues to remain bullish while trading above its signal line. If we look at pattern analysis, NIFTY has evidently broken out from a short term falling trend. It continues to remain in the 27-month long upward rising channel and the primary up trend remains intact. 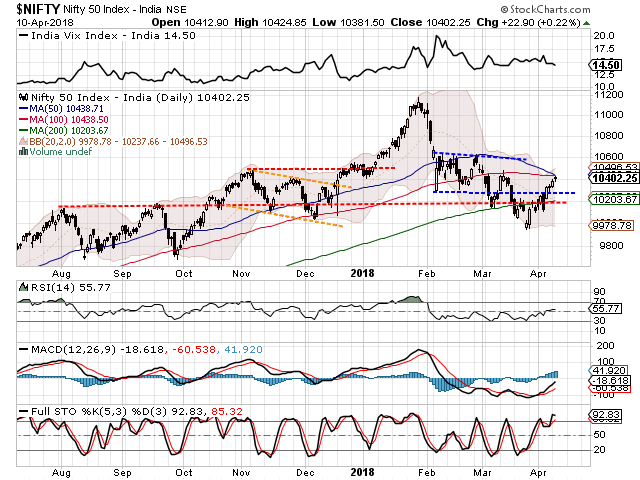 On the immediate short term, the NIFTY is expected to encounter resistance at the 50-DMA and the 100-DMA on the Daily Charts. Overall, we may once again see the Markets getting a relatively stable opening and a modestly positive start. However, the Markets in general may encounter resistance at 50-DMA and 100-DMA which converge at the same level of 10438. There are chances that the NIFTY attempts to move past these levels and at the same time, faces some resistance at higher levels as well. We see some inevitable consolidation happening and this may occur in a capped range and bring some volatility as well. We recommend protecting profits at higher levels and also make select purchases with each period of consolidation that the Markets offer. Relatively buoyant technical set up is seen on counters like IDBI BANK, BHARTI AIRTEL, MONNET ISPAT, HDFC STANDARD LIFE, GRAPHITE INDIA, BAJAJ ELECTRICALS, RAMCO CEMENT, JUBILIENT LIFE and HEG LTD.